1.2. Automatic Limit Sensor control for Paper delivery. 1.3. Web-Guider system(=E.P.C) with Splice table. 1.4. Auto Stop when paper exhaust. 2.2. 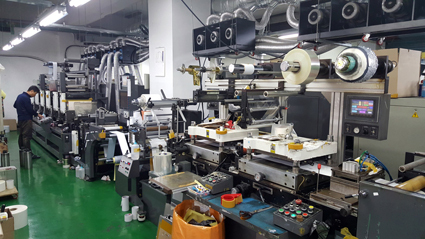 Easy to precise registration adjustment with unique slide print system and Japan AC Servo motor feed unit system of unwind/rewind. 2.4. Quick engage inking & transfer system. 2.5. Print Cylinder: 2sets x 16pcs. 3. FLAT BED DIE-CUTTING UNIT. 3.3. Flat Bed Die-Cut Blade Height: 8mm. 3.4. Strong flat-bed die-cut pressure by applying the inertial fly-wheel system with digital setting control by Japan DD servo motor feed unit. 3.6. Mark Sensor Scanner for 2nd pass job. 6.4. Strong Heating pressure by applying the inertial fly-wheel system with digital setting control by AC servo motor feed unit and and Hot-foil film feeding control by AC servo motor. 8.1. 3 kw at 1st, 2nd, 3rd, 4th, 5th, 6th Front color and 7th back side Print unit(7 units) with touch screen controller. 10. Included the 1 used Auto Rewinder.